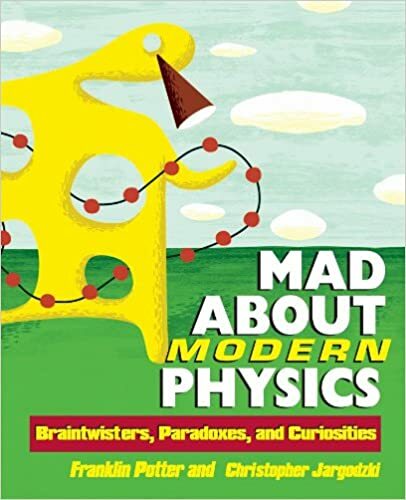 The sequel to the popular Mad About Physics, Mad About Modern Physics promises endless hours of entertaining, challenging fun. With detailed answers to hundreds of questions (""Are fluorescent lights dangerous to your health? "", ""What is a fuel cell? ""), the book is also a treasure trove of fun science trivia. Featuring diagrams and illustrations throughout, this fascinating physics compendium will educate and captivate students, teachers, and science buffs alike. FRANKLIN POTTER, Ph.D., is a retired physicist from the University of California at Irvine. He continues to conduct research in elementary particle physics and cosmology, as well as consult in physics education. CHRISTOPHER JARGODZKI, Ph.D., is Professor of Physics at Central Missouri State University. He is also founder and director of Center for Cooperative Phenomena. He was born and raised in Poland, and received his Ph.D. in quantum field theory from the University of California at Irvine.